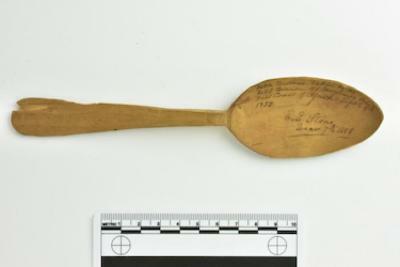 Wood spoon taken from captured slave ship in 1858. Spoon reads: Ketch-Brothers. Taken by the USS Marion off Mayumba Point West Coast of Africa Sept. 8th 1858. E.E Stone Dec. 7th 1858. Ketch is the type of ship and Brothers in the name of the ship (this information was given by Madeleine Burnside 10/25/2018).